Almond Butter Blackberry Jam Thumbprint Cookies! A fun take on the classic thumbprint cookie! Check out another fave from by Lyndsay Sung of Coco Cake. File these under: super easy and super delicious. Also, healthy-ish! 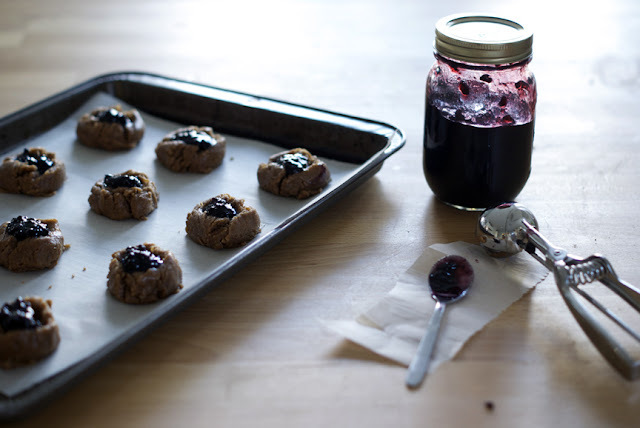 I made them with whole spelt flour and pure maple syrup, and a ridiculously delicious, tartly-sweet, rustic blackberry jam my friends Ashley and Hayden gave me (Hayden made the jam). You can also replace the spelt flour with whole wheat flour (or regular all purpose flour), or rice flour to make these gluten-free! Oh yeah! You can also use any type of jam you like. 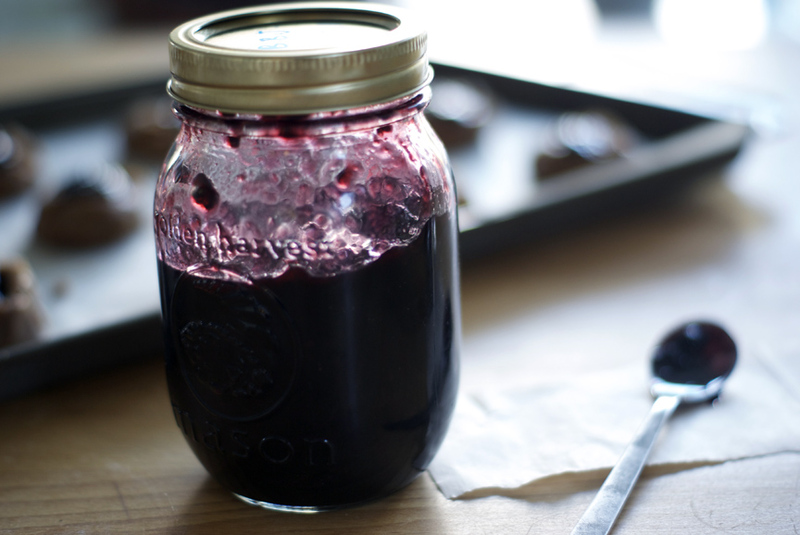 I like a nice tart jam. I'm actually a bit jam-crazy. It's hard for me to resist an adorably packaged jar of lovely fruit jam. This recipe is easy-on-the-sugar and while it does have maple syrup, it relies on the jam for its sweetness. Preheat oven to 350 degrees. 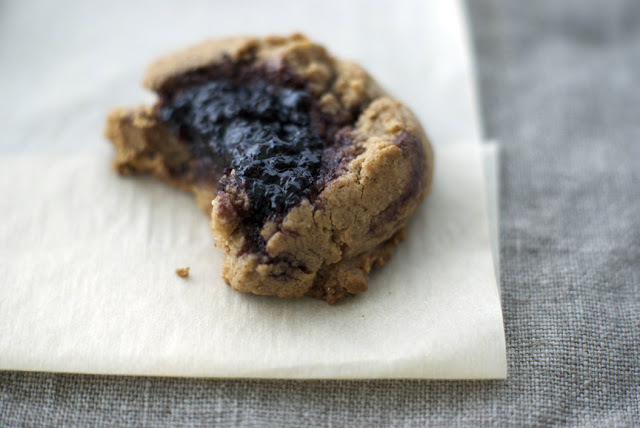 This recipes yields about 1.5 dozen cookies! 1. In a medium bowl, combine the almond butter, maple syrup, oil and vanilla extract until well-mixed. 2. In another medium bowl, sift the spelt (or gluten free) flour and salt. 3. Add the dry ingredients to the wet, and mix until nicely combined. 4. Using a small ice cream scoop or your hands, dole out the batter into 1.5 inch balls on parchment-paper covered baking sheets. 5. Squash those balls right down with your clean, just-washed thumb! Make sure you've created a nice well that the jam can happily sit in. 6. 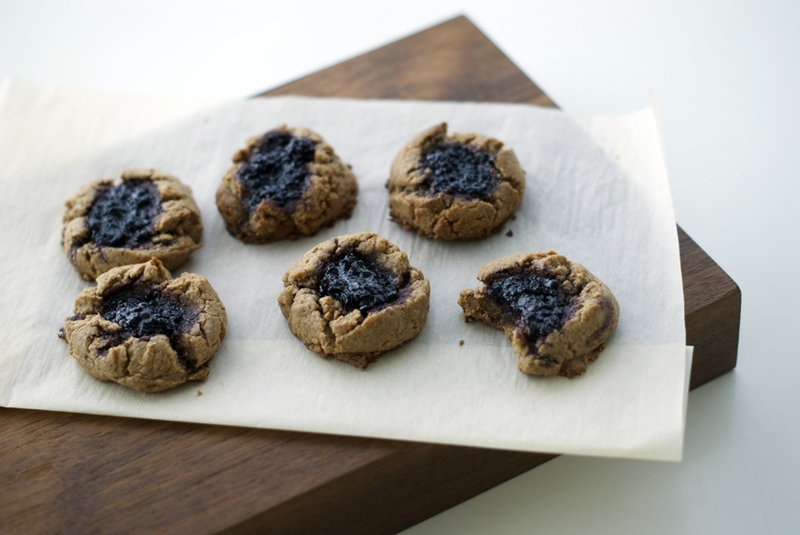 Spoon your chosen jam into the thumbprint-created wells! 7. Bake for 12-14 minutes, turning baking sheets halfway to ensure even baking. 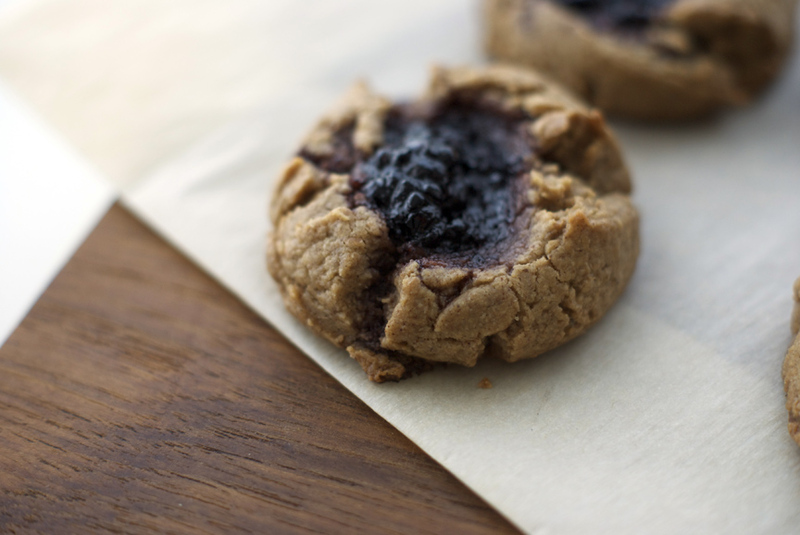 Chomp into these easy-breezy almond butter jam cookies (like I did, above)! Enjoy, Poppytalk readers! Dive into the sea of creation and explore our drops of inspiration! You can find carefully selected and visually stunning drops from categories like graphic design, art, illustration, photography, architecture, motion graphics, product design and many more! Oh these look so tasty!